Christ in America. Artist Unknown. Jacob the son of Lehi similarly connected the spiritual and physical gathering, saying that the Jews would be “restored to the true church and fold of God; when they shall be gathered home to the lands of their inheritance, and shall be established in all their lands of promise” (2 Nephi 9:2, Isaiah 14:2). Christ Himself also made the connection between a physical and spiritual gathering. He said that “the dispersed of my people” would be prepared to “come unto me, that they may call on the Father in my name” (3 Nephi 21:27). He followed this by saying they would be “gathered home to the land of their inheritance” (3 Nephi 21:28). This seems to suggest a connection between coming unto Christ, a spiritual gathering, and being gathered to the lands of their inheritance, which is a physical gathering. It may be easy to think of the gathering as something that will happen far in the future. Yet the Book of Mormon and Doctrine and Covenants show that the spiritual gathering is taking place right now. 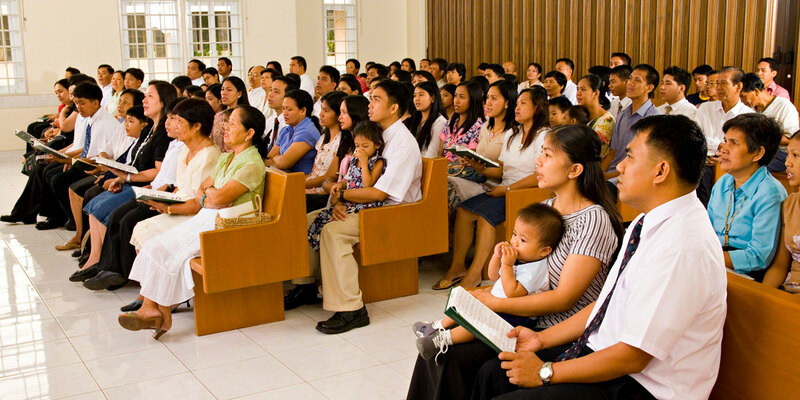 The Prophet Joseph Smith taught, “All that the prophets … have written ... in speaking of the salvation of Israel in the last days, goes directly to show that it consists in the work of the gathering.”14 Those who desire to contribute to the spiritual salvation of Israel can assist in gathering scattered Israel through missionary work. The Lord told Ezra Thayre that if he opened his mouth to preach the gospel, it would “be filled, and you shall become even as Nephi of old” (Doctrine and Covenants 33:7–8). The same is true today. Participating in the spiritual gathering can transform lives in profound ways. Sister Austin said that participating in the gathering gave her a “life of benevolence to those who were unfortunate and needy; a life to bind up the broken-hearted and comfort the mourner; a life to teach by example, as well as precept; a life of charity; a life to show to the world that we had been with Christ, and learned of Him.”16 Realizing that the gathering has a spiritual element reminds the faithful that they can help gather scattered Israel, making their lives better for themselves and those around them. Andrew C. Reed, “Framing the Restoration and Gathering: Orson Hyde and Early Mormon Understanding of Israel, Jews, and the Second Coming,” in Foundations of the Restoration: Fulfillment of the Covenant Purposes, ed. Craig James Ostler, Michael Hubbard MacKay, and Barbara Morgan Gardner (Salt Lake City and Provo, UT: Deseret Book and Religious Studies Center, Brigham Young University, 2016), 225–244. Janiece Johnson and Jennifer Reeder, The Witness of Women: Firsthand Experiences and Testimonies from the Restoration (Salt Lake City, UT: Deseret Book, 2016), 155–165. Elizabeth Maki, “‘Go to the Ohio’,” in Revelations in Context, January 4, 2013, online at history.lds.org. Robert L. Millet, “Israel, Gathering of,” in Book of Mormon Reference Companion, ed. Dennis L. Largey (Salt Lake City, UT: Deseret Book, 2003), 403–406. 1. For more on the gathering in modern times, see Joseph F. Darowski, “The Journey of the Colesville Branch,” in Revelations in Context, February 12, 2013, online at history.lds.org. 2. Newel Knight, Autobiography, circa 1871 (Salt Lake City, UT: Church History Library, 2013), 268–269. 3. Elizabeth Maki, “‘Go to the Ohio’,” in Revelations in Context, January 4, 2013, online at history.lds.org. 4. Of the 69 scriptural verses quoted by Moroni to Joseph Smith during “the night vision,” 31 refer to latter-day Israel and 26 to the gathering of Israel, so it seems that Moroni made a connection between the Book of Mormon and gathering. See Gerald E. Smith, Schooling the Prophet: How the Book of Mormon Influenced Joseph Smith and the Early Restoration (Provo, UT: Neal A. Maxwell Institute for Religious Scholarship, 2015), 26. 5. Edward F. Campbell Jr., “A Land Divided: Judah and Israel from the Death of Solomon to the Fall of Samaria,” in The Oxford History of the Biblical World, ed. Michael D. Coogan (New York, NY: Oxford University Press, 1998), 239. 6. Mordechai Cogan, “Into Exile: From the Assyrian Conquest of Israel to the Fall of Babylon,” in The Oxford History of the Biblical World, 266. 7. Amy-Jill Levine, “Visions of Kingdoms: From Pompey to the First Jewish Revolt,” in The Oxford History of the Biblical World, 383. 8. Book of Mormon Central, “Why Do Early Nephite Prophets Speak about the Scattering of Israel? (2 Nephi 25:15),” KnoWhy 42 (February 26, 2016). 9. For more on the gathering, see Book of Mormon Central, “Why Did Jesus Say That There Were ‘Other Sheep’ Who Would Hear His Voice? (3 Nephi 15:21; cf. John 10:16),” KnoWhy 207 (October 11, 2016). 10. Andrew C. Reed, “Framing the Restoration and Gathering: Orson Hyde and Early Mormon Understanding of Israel, Jews, and the Second Coming,” in Foundations of the Restoration: Fulfillment of the Covenant Purposes, ed. Craig James Ostler, Michael Hubbard MacKay, and Barbara Morgan Gardner (Salt Lake City and Provo, UT: Deseret Book and Religious Studies Center, Brigham Young University, 2016), 226. 11. Book of Mormon Central, “Why Did Moroni Quote Isaiah 11 To Joseph Smith? (2 Nephi 21:10),” KnoWhy 50 (March 9, 2016). 12. See 2 Nephi 21:11; 25:17; 29:1; and Jacob 6:2. 13. Janiece Johnson and Jennifer Reeder, The Witness of Women: Firsthand Experiences and Testimonies from the Restoration (Salt Lake City, UT: Deseret Book, 2016), 157. 14. Joseph Fielding Smith, comp. and ed., Teachings of the Prophet Joseph Smith (Salt Lake City, UT: Deseret Book, 1977), 83. 15. Brigham Young, Journal of Discourses (Liverpool, UK: George Q. Cannon, 1861), 1:138. 16. Johnson and Reeder, Witness of Women, 158.